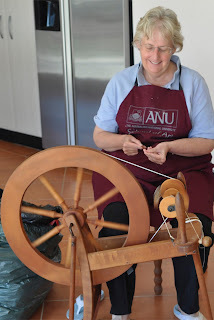 My friend, Jordan, wanted a spinning lesson, so I put aside my high-tech, computerised, do-everything sewing machine, and dusted off my low-tech spinning wheel. I hadn't done any spinning for years but I soon regained the hang of it and remembered how relaxing and soothing it is to work at a spinning wheel. One day I will learn how to spin. I have always though it looked relaxing. Enjoy.